This entry was posted on November 2, 2015, 6:55 am and is filed under Motivation. You can follow any responses to this entry through RSS 2.0. You can leave a response, or trackback from your own site. My latest book, Escape Points, is about how Coach Mike Powell (OPRF in Illinois) and wrestling helped my three sons become good men. Let me know if I can send you a copy of the book, would love your take. Thanks, Mitch! great perspective Michele, especially dignity in loss. Thanks for sharing. Fantastic! what a very well written blog. I agree wrestling may teach all of these lessons. However, you did not talk about the down side– having to drop weight, starving to meet weight, sweating in a sauna suit to meet weight, etc. I have seen young men have to do this from the junior high level all the way to the college level. One young man was told he needed to wrestle in a lower weight class. He was not comfortable doing this, so they pulled his scholarship. He had been wrestling in the next weight class. Maybe this is not a part of every wrestling program, but it is done in many programs. So I am not a big fan of having my grandsons wrestle. All 5 of my son’s wrestled as did their father and uncles. We love the sport, but you are right the “making weight” part is a big down side. But nothing worthwhile comes without opposition. It has become illegal in AZ to drop too much weight. There are ways to eat so one can maintain their weight class all season. Don’t throw the baby out with the bathwater. In response to the making weight aspect of it all. I was 6’2″ in high school and cut from 195 (football season) to 160 wrestling season because i felt that I was strongest there and 3 state championship and a runner up says I was right. Most states have a required minimum they will allow a kids to cut to and the minimum is 5% I believe now after following an underwater test if available. I remember drinking only water for a day but it was my choice and I loved every minute of it.. My kid is in his second year wrestling 1st grade and already has a goal to out medal me. He already doesn’t est before weigh ins to wrestle lighter. Then of course like everyone here eats like a horse after weigh ins haha.. It’s all in your choices, choose to eat right maintain weigh feel good. Eat junk food stay up late and feel shity your choice. I wrestled for 9 years and not once did I ever have to drop weight. ..that is a decision between the wrestler and coach. It mostly falls on the wrestler and whether or not he is comfortable wrestling up. Yes I understand where you are coming from but at the same time you also have to consider how wrestling benefits the life of the wrestler. It taught me what it meant to work hard for something and I’m only 24. For my generation that is rare. Everyone wants everything handed to then in a platter. Not trying to belittle your concern for your grandkids. But informing you on how it can change there lives. In California they do not allow the drastic weight drop. In fact the kids have to go through a hydration test which tells the coaches how much the kids are allowed to loose throughout the season if any at all and the coaches have to abide by these results. I completely agree with you! My son is a wrestler and is now a Sophomore.. we are getting ready for wrestling and are excited for another great season. I have taught my son and remind him regularly that he wins or learns, we dont say we lost because as long as he learned something, he won. My sons ultimate goal is to wrestle in college. I know he has 2 years left, but as a mother, I want to fo everything I can to help him reach that goal. Any suggestions? If you cut weight right you don’t have to starve you’re self, there are ways of cutting weight that allow you to still eat. I’ve come to miss wrestling after moving to a new school without a program. If the kid didn’t want to get up at a certain time and go to work he would be fired. If u don’t want to dedicate your self for the sport you shouldn’t play with the big boys. None of your downside happens with the right coaching staff and supervision of the wrestlers. 55 years ago, I cut weight. Ignorantly and without good supervision; that was normal. My mother was a nurse and a great cook and it was very hard on her and me. Twenty years later when I was a Junior High coach, I was very aware of my boys (including my sons) health; weight being a part of it. I never encouraged it and had a run in with a father that I told his son would not be allowed to wrestle at a lower weight. I think good nutrition is the great untapped opportunity for most athletes at all levels to drastically improve. Another thing about Wrestling is how much it is a team sport – you can’t practice it alone. There is a easier solution, move up to the next weight class. There is no need to starve yourself or dehydrate yourself to make weight. Great piece! I hope parents and kids everywhere are encouraged. I have wrestled and coached wrestling. As such, I am a recipient of those lessons, as well as, seen first hand the positive impact of those lessons on other young men. Superb job Mr Arnold! Very good blog post on wrestling. I was a varsity heavy weight wrestler in high school, and it did teach me a lot about these things. I had great coaches, and value my experience in wrestling very much. I agree totally. My daughter has been a wrestler since sixth grade. She is now a junior and has stayed with it. It is brutal for me as mom to watch sometimes but I am always there and support her and her team! my son wrestled for 9 years – from youth to one year in college. he learned discipline, self reliance and consequences for slips in diet, work out routines and focus on the mat. he loved football, but not one college wanted to look at a 5’8″/200# lineman. we can’t wait for one of our grandchildren to be old enough to take the mat! And for these and a couple more, I personally favor swimming, esp at 77. Loved this article. I wrestled in high school about 16 years ago & will never forget the things it taught me: discipline, confidence, to be bold, not to worry about what others think and to go for what you want in life. It also taught me that people will doubt you, especially when you’re different. Wrestling has always been a male dominated sport and that was certainly true when I was a kid. Wrestling teams form a special bond that lasts for decades, you see each other at your best, triumphant and your most raw & broken. Thank you for leaving this article largely gender neutral. As a Grandmother raising a 14 year old your article help me make the decision to let he wrestle. Thank you. what is best age to start kids in wrestling? when you and your child are in sync. Make sure that they understand what you and the coaches expect, and that he is able to commit to it. Thayers can start as early as kindergarten. Depends on your child and his ability to take and follow direction without disrupting all of the other wrestlers and coaches. Just remember there is always a winner and a loser in every match. It is the only sport for that age where they actually keep score and stand face to face as one wrestler gets his hand raised and the other does not. As a former wrestler, I agree with most of your points. However, the sport is a complete disaster with the weight cutting. Nothing has changed and it has taught kids to starve themselves to secure a spot on the mat. This leads to health issues and stunted growth. I would not let either of my sons wrestle until this huge problem is addressed. The problem however is that “cutting weight” is part of the culture. It is so ingrained that you even listed as a reason to have your kids wrestle. It has nothing to do with discipline and everything to do with a sport that does not know how to protect the health of its young athletes. I never starved my self for wrestling that’s a personal choice. if you eat right and work hard you should never have to not eat. If I had a match coming up and I was 6ids over I would jump on the treadmill for a hour and a half with weights after a day or two I would be on weight. I do not believe you wrestled! I am a high school wrestle, and you’re concerns for cutting weight don’t exist any more. It doesn’t matter what state you are in, they will only let you lose a certain amount of weight. For example I weigh 164lbs I can only cut to 147lbs and I have 18% body fat. If I go bellow 147 which I can do very easily they will not allow me to wrestle. And there is so much information out there on losing weight, there is no reason for starving, I can cut 15lbs off and still eat you just have to do it right. Great article. As a coach one life lesson I also included was how your individual actions affect not only you but others around you. There is an individual AND team aspect to this sport. On the mat you win and loss alone. But what you do (or don’t do) on the mat impacts your team’s score and what they must do next. This is a great article EXCEPT for the fact that the author never mentions wrestling being a terrific opportunity for girls and women. In addition to all the reasons given for why “your kid” should wrestle, the college ranks now have enticing scholarship opportunities and competitive programs for women. And just like men, women’s wrestling is also an Olympic sport. When my son started wrestling the first thing we discussed was cutting weight. Under no circumstances would he be allowed drastic weight changes! If any changes were made he would go up in weight classes before down. What he has learned is how to maintain a healthy weight for him through diet and exercising. He knows at the age of 13 the importance of using the proper foods his body needs for fuel and energy. First thing he decided was no more soda then do I really want those French fries, pizza or any other junk food? It wasn’t worth it to him to not make the better choice. He feels better and has a better understanding the lifelong benefits of healthy eating habits than most adults! Sure it’s for wrestling right now but the knowledge he has now will go beyond his wrestling career! There are ways to teach wrestlers the proper way to maintain a healthy weight for competition it doesn’t have to be so exteme. I have 4 sons that were wrestlers, They are very spread out in age my oldest is 20 years older then my youngest, So I have been around wrestling for 20 years or more . wrestling has come a long way on cutting weight. We live in IN. and you can only cut so much weight now. As a parent its your job to make sure your son does not cut to much weight, all you have to say is NO ! Done it many times ! My oldest son went on in college to be a National Champ ! And now is your High School Wrestling Coach. As far as cutting weight, I am thankful our athletic trainer and our high school coaches work so closely together. They measure the kids (height, weight, BMI, etc). Once they weigh in and this is all calculated, there is a weight that they cannot go below. Our coach is an awesome man and would NEVER put our kids in sauna suits and what not. He will not risk jeopardizing a kid’s health to “make weight.” Last year was my son’s first year EVER in wrestling as a high school freshman and he loved it so much and worked so hard that he was one win away from making sectionals. He will be in a higher weight class this year, so that presents even more challenges, but I have no doubt how competitive he will be. Wrestling has also helped his playing on the football field. He was making moves at running back that I know he wouldn’t have been able to do had he not been a wrestler! I wrestled from 2nd grade until 12th grade, Excellent sport, Everything this article said is true. Its not a team effort, anything that happens on the mat is up to the wrestler. Your going to be as good as you train and how much heart you have. I am 49 yrs. of age now and I still love the sport. I coached for a while and that was very rewarding for me as well. I am now a retired law enforcement officer after 26 yrs and being trained in wrestling helped me out numerous times in physical confrontation helping me to protect myself. I’m an instructor now in the police academy and we actually teach wrestling (grappling) to our recruits. It is beneficial in so many ways. I have 5 children and all 5 wrestle. My first 3 are boys and last year their 9 year old twin sisters started to wrestle. I just read this article aloud to the girls and it really upset them that at the end of this great article you referred to a wrestle as only a boy. Girls wrestle too! Imagine all the confidence it takes and strength it takes for a girl to step on a wrestling mat. Every year there are young girls, middle and high school girls, and even college age girls that wrestle and even win spots on teams and win state championships. Wrestling is a tough sport but girls do it too. I wrestled in High School and a couple years in college. That experience and the 4 different programs my sons have wrestled in (Club, Jr High, and High School) I have never seen a program where cutting weight was mandatory or even encouraged. My HS program as well as my son’s current program, the wrestler chooses his weight, Add to that today they monitor hydration and BMI so excessive weight cutting in not allowed. Most of the stories I hear about cutting weight are fictional. I sure in the past their was some programs that encouraged it and demanded it, but they were bad programs. From my experience they are few and far between. Great article. To add another, wrestling is a sport that is contested all year round. Scholastic style can go all year round, freestyle and Greco go on during the spring and summer, and Beach Wrestling (Sand Wrestling) can keep it fun while encouraging others to watch you outdoors. There isn’t an age where one must retire either, I’ve seen 80 year old wrestlers still going at it, provided there local wrestling tournaments have adult divisions (and really, all of them should). Again, great post. hi. i started wrestling as a kid at 5 yrs old. had a best friend who joined with me. back then, i beat the champion, and became champ. i held a title belt for a yr and 4 months, till my best friend turned on me and we got into a fight at 6 yrs old, and he beat me up pretty bad, and the next morning in school, i faced him and put title belt on the line, and he beat me in 5 minutes and was crowned new champ. Awesome article and many super comments. I tried many sports as a youth but focused on just 3 as a teen – Folkstyle, Freestyle and Greco! In addition to developing an intense worth ethic, self discipline, perseverance and many other life skills, wrestling taught me to eat nutritiously and take good care of health. Sure it takes some discipline to make your weight class, but I encourage my students to eat healthy and compete at a weight close to what they weigh out of practice. Our sport builds Champions on the mats and in life! My sone can learn all of what you stated with his baseball team or golfing tournaments – or in his Cub Scout troop. He does not need to put his health at risk to learn valuable life lessons. Anyway, as the college coaches told us, despite our son (age 8) having really good potential in wrestling he is simply too young. Most kids that start too young end up resenting the sport by the time they should be doing it. There is a time and place for this but not at such a young age (maybe instructional with practice matches etc but where we lived the coaches were all win win win – that puts off little ones to this sport. Your article was beautifully written. It might have calmed my fears if I had read this before my twelve year old son announced he was going to wrestling tryouts. We have had a difficult year. Last Thanksgiving, our older son died suddenly in his sleep. the grief has been unimaginable. For our younger son, his whole world collapsed. His older brother was cool, hip and awesome (the younger one’s words). Our younger son asked to read scripture at his brother’s funeral and sang “Because He Lives” in his brother’s honor. He was so brave that day, and has been every day since, but he is still sad. A month after our son died, I became very ill. That illness forced me into retirement at 46. I can no longer fly or travel more than an hour in the car. I can no longer do housework or yardwork. I can no longer play with my son at the park. I can no longer be a Scout mom because my wheelchair and medical equipment are not campground friendly. Our younger son took up the slack with the housework cleaning the dishes and learning how to do laundry. He is still grieving his brother’s death. He is very sad what the loss of my career has meant to me, and the strenuous financial position the loss of my salary has meant to our family. He is still sad. So when the subject of wrestling tryouts came up, my husband and I were stumped. He has been on the swim team for four years, and loves it, but this child is a lover not a fighter. Despite our misgivings, we agreed to let him try out. We were surprised when he made the team. His new schedule has him working out two and a half hours after school five days a week. He comes out of the gym every day soaked in sweat with a big grin on his face. He is still sad. The season started November 10th. He has lost every match, but we could see definitive growth, both physically and mentally, from tournament to tournament. Tonight, he won his first match. Living in a small town, all his teammates and the other parents knew our older son, grieved openly with us and helped out since my illness began. When my son pinned his competitor tonight, the entire arena exploded with everyone chanting his name. He shook hands with his competitor and the opposing coach and ran to his coaches pounding his own chest while the crowd cheered. He ran over to where my husband and I sat, and hugged us simultaneously while I cried. I haven’t seen him this happy for a year. Wrestling has taken a child that was in a deep dark place, and made him whole again. If he never wins again, I know he will be okay. The adversity our son has overcome in this last year is immeasurable. He has maintained his grades in the gifted program, and continues to serve as an acolyte every Sunday. He is strong in his faith and loves learning, but wrestling gave him his spirit back. God bless this sport. Listen to Mitch. Let your child give wrestling a chance. It is a character building experience, and sometimes, a lifesaver. Thanks for the uplift this morning. Good luck to you, your son and family. Here we are just one year later, Mitch. With the help of puberty came muscles and with cross country came greater endurance. Oh, and he’s grown sixteen inches in the last twelve months! 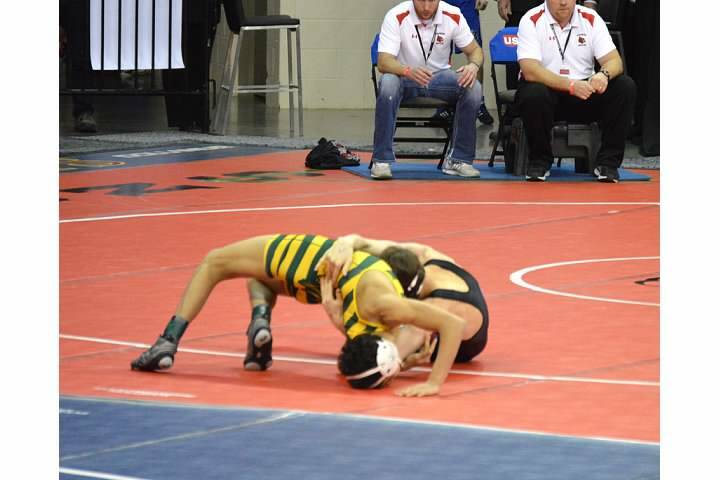 We are just one month into the wrestling season, and he already has twelve wins…ten by pin and two on points. He now wants to wrestle clear through high school and college. We have researched scholarship programs for wrestling and they are few and far between. So our son has devised a plan to maintain his straight A reports and earn an academic scholarship to his father’s alma mater…just so he can wrestle. He is always happy now. Parents, if you are hesitating allowing your child to try wrestling…give it a chance. It helped bring our young son from a dark place of despair following his older brother’s death and gave him brotherhood, teamwork, focus, a newly define self-actualized personality and a clearly defined plan to complete his undergrad. He thinks he will try out as a wrestling coach while obtaining his master’s degree. Great article, I’ve been trying to tell parents for years. Great article Mitch! Fantastic reasons why kids should get onto the mats with the support of their parents as well. Theres so many benefits that extend well beyond the time in training rooms, into their personal and social lives. Thanks for putting this out there! I really needed to read this article. I was very triggered watching my son wrestle for the first time and it was painful to sit and watch. This is my problem and Im reading everything I can to help shift the panic that came over me. He was all smiles and even though he did get his neck cranked on he said he had fun. I want to support him and I am working on being a supportive parent even when I want to rescue. Thanks for these words of experience. I have played a lot of sports and wrestling was the toughest. But it also was the one which allowed you to succeed not on the basis of your size but on the basis of your desire and work to accomplish your goals. It helped me understand what you needed to do to succeed. While you are responsible for your achievements, or lack thereof, you have the comeraderie of training with a team. I enjoyed my years of wrestling in both high school and university and I think wrestling helped me learn the attributes that helped me succeed in sport, as well as my profession and also deal with the difficulties life throws your way. I am very thankful to my high school coach who was instrumental in helping me to learn those attributes.